Questions linger on value of Xander Bogaerts, Jackie Bradley Jr.
Rookies Xander Bogaerts (left) and Jackie Bradley Jr. have struggled this season. Players usually show something positive in their rookie seasons. Bradley has been stellar defensively, but his hitting has been off-the-charts bad. Bogaerts hasn’t excelled in either area, though at 21 he’s the youngest Red Sox rookie starter since Ellis Burks in 1987. Dustin Pedroia won AL Rookie of the Year hitting .317 with an .823 OPS in 2007. Jacoby Ellsbury hit .280 with 50 steals in 2008 in his rookie season. Mike Greenwell hit .328 with 19 homers and 89 RBIs with a .956 OPS in his first full season in 1987 and finished fourth in the Rookie of the Year voting. Burks, 22 at the time, hit .272 with 20 homers, 59 RBIs, and 27 steals. 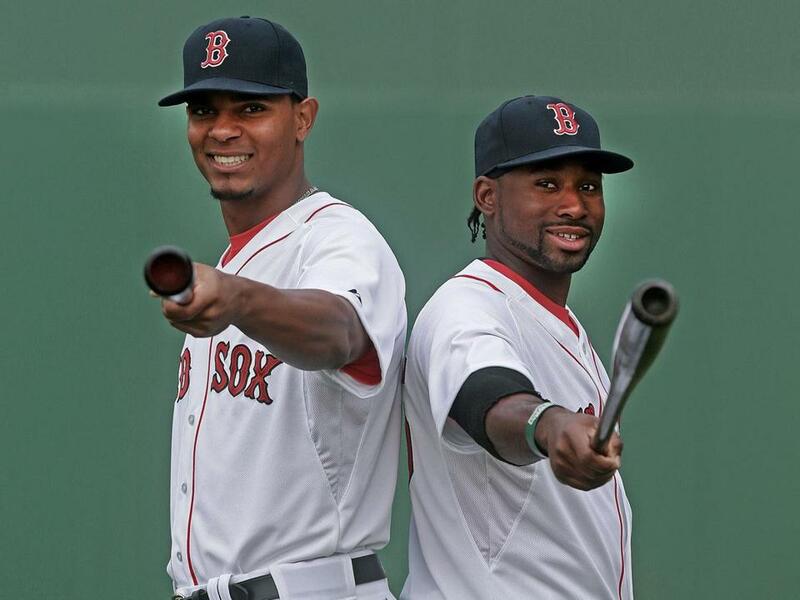 Is it a lack of seasoning for Bogaerts and Bradley? Hurried to the majors? Bogaerts had 225 at-bats at Triple A, Bradley 320. Former Red Sox GM Theo Epstein always believed you should get 500 at-bats in Triple A. Have both players lost value? Exposure can be good and bad. In Bradley Jr.’s case, it was a bad thing. The Red Sox have no idea if Bogaerts is a shortstop or a third baseman. They have no idea what type of hitter he is. The good news is he’s 21. And right now that’s about as good as it gets. I asked statistician Bill Chuck for stats to reflect the futility of these youngsters. It’s gruesome. On pitchers’ counts, Bradley is hitting .154. He has gone hitless in 52 games this season. He has struck out in 68 games. He’s had 17 multi-hit games. He’s had 18 extra-base hit games. Among batters with fewer than five homers, he has the most strikeouts (1 HR, 102 K’s). Starling Marte is next (5/96). Bradley’s had 28 multi-strikeout games. Bradley is on his second homerless streak of 48 games. He’s hitting .214 at Fenway and .218 on the road. Leading off an inning he’s hitting .130. On pitches that are up, he’s hitting .087; up in the middle part of the plate, he’s hitting .050. He’s hitting .128 on curves, .143 on sliders. He has swung at 626 pitches, missed 174, chased 180. He swings at pitches out of the strike zone 25.7 percent of the time. He has a 38.3 percent called strike percentage, the eighth highest in the majors. When Bogaerts has two strikes (which he has had 259 times), he’s hitting .191. With a runner on third and less than two outs, Bogaerts is hitting .063 (1 for 16). He has had 50 productive out opportunities and has been successful 13 times. He has come to the plate with 254 runners on base and 21 have scored (8 percent). He has had 87 strikeouts swinging and 18 looking. Of the 87 swinging, he’s getting killed on pitches down, in and around the strike zone, which accounts for 56 of the whiffs; 47 are on pitches on the outer half of the plate. On pitches down and away, he’s hitting .106. Of his 93 hits, only 11 are to the opposite field. He has gone hitless in 42 games this season. He has gone RBI-less in 81 games this season. He has extra-base hits in 28 games. He has struck out in 67 games. With two outs, he’s hitting .192. With runners in scoring position he’s hitting .116. With men on he’s hitting .174. With two outs and runners in scoring position, he’s hitting .093. He has hit .182 as a third baseman and .282 at short. Since moving back to shortstop on Aug. 1, he’s 3 for 24 (heading into Friday). The Red Sox organization does not believe the back-and-forth moves have led to the downward spiral at the plate. Bogaerts simply hasn’t made adjustments. Bogaerts and Bradley were the two most touted Sox’ prospects since Pedroia and Ellsbury, Nomar Garciaparra and Jason Varitek (who was developed by the Mariners), Burks and Greenwell. All had very good major league careers. Although there’s still six weeks to go, the Red Sox might not know at season’s end what they have in Bogaerts and Bradley. They will commit to Bogaerts, but Bradley seems to have to show some marked improvement to have the center-field job handed to him for 2015. Never have two young players been so hyped by their own team and by the media (guilty as charged). But nobody saw this coming. 1. Sons of Yankees: Yankees bench coach Tony Pena’s son, Francisco, 24, is a catcher at Triple A Omaha in the Royals’ system. Pena is hitting . 255 with 24 homers and 51 RBIs, good for an .864 OPS. Hitting coach Kevin Long’s son, Jaron, is a combined 10-3 with a 2.27 ERA in 23 games, 13 starts, between A ball and Double A Trenton, where he’s 5-0 with a 2.78 ERA. 2. Interesting data from Stats Inc. on walks: hitters are walking at a rate of once every 12.88 plate appearances, the lowest figure since the mound was lowered following the pitcher-dominated 1968 campaign. Home runs are down, one per 39.03 at-bats this season, the lowest since 1992. If the walk numbers hold, this will be the fourth straight season in which MLB establishes a post-1968 low for walk rate. Stats also figured that between 1974 and 1976, batters hitting first in their team’s lineup walked at a rate of once per 11.47 plate appearances. In the period from 2011 through Aug. 6 this season, that figure is down about 12 percent to one walk per 12.91 plate appearances for leadoff men. Only one player in 2014 has drawn as many as 50 walks from the No. 1 lineup spot — the Cardinals’ Matt Carpenter, who has 63 walks, all of them while batting leadoff. Between 1974 and 1980, an average of more than five players per season walked at least 60 times from the leadoff spot. 3. The Tigers threw three Cy Young winners at the Yankees last week, and they lost three out of four games, outpitched by the likes of Chris Capuano and Shane Greene. The Yankees are incredibly resilient. 4. How can anyone compare Mike Lowell leaving money on the table to sign with Boston over Philly and Shane Victorino taking three years with Boston over four years with Cleveland with Jon Lester’s situation? Not even in the same stratosphere. Lester could leave up to $50 million on the table to sign with Boston? Yeah, right. 5. David Ortiz believes it will be harder for Alex Rodriguez to return to the Yankees next season. “The older you get the harder it is,” Ortiz said. “He’ll be 40 years old. Maybe he’ll heal up from his physical things [hip], but I know if I got hurt and I took a year off, I don’t know if I’d be able to come back at this age. Alex is older than I am.” Ortiz said he’s had no contact with A-Rod this season. 6. If Pedro Martinez thinks he can fix Clay Buchholz, why isn’t he fixing him? 7. Don’t think in 30 years of covering baseball I’ve ever seen a team (the Phillies) spend so much time scouting another team (the Red Sox) and not pull the trigger on a deal. Even after the trade deadline, the Phillies have had a scout in Boston, St. Louis, and Anaheim watching Boston’s young players. The match would be Cole Hamels for young players, and it may very well heat up this offseason. Hamels, according to a source close to him, would be open to a deal with the Red Sox. Former first-round draft pick Matt Murton, 32, is in his fifth season with the Hanshin Tigers and is hitting .348 with 11 homers and 62 RBIs. The righthanded-hitting outfielder is second in the Central League in hitting to Ryosuke Morioka, who is hitting .356. Murton was the “other” Red Sox player dealt with Nomar Garciaparra in the four-team deal at the trading deadline in 2004. Wily Mo Pena, who plays for the Orix Buffaloes, leads the Pacific League with 25 homers and has knocked in 63 runs to go with his .250 average and .885 OPS. Pena, 32, was acquired by the Red Sox for Bronson Arroyo, but he never panned out. Japan’s big home run hitter this season is former Tiger Brad Eldred, who has 33 to lead the Central League. He also has 90 RBIs. The 6-6, 270-pound righthanded slugger plays for the Hiroshima Carp. Another former Red Sox, Mauro Gomez, has swatted 18 homers with 78 RBIs to go with a .288 average. Last year’s MVP, Wladimir Balentien, is following up his magnificent 2013 season, in which he hit .330 with 60 homers and 131 RBIs with a 1.234 OPS, with 23 homers and 51 RBIs with a .300 average this season. He has 1.009 OPS for the Pacific League Yakult Swallows. Another former major leaguer having a big year is Ernesto Mejia, a former Atlanta Brave. The 6-5, 260-pound, 28-year-old righthanded hitter is batting .313 with 18 homers, 39 RBIs and a .992 OPS. Righthander Kenta Maeda, who will be the next big-time pitcher posted and coming to the United States, is 9-4 with a 2.10 ERA in 17 starts for Hiroshima. Described as a poor man’s Masahiro Tanaka, Maeda, 26, has had a solid Japanese career. But the most interesting player in Japan is 20-year-old Shohei Otani, who is pitching and playing the outfield. Otani is hitting .268 with five homers and 23 RBIs with a .791 OPS, while going 9-2 with a 2.17 ERA in 17 starts with a 1.098 WHIP. He has 134 strikeouts in 112 innings pitching. Otani is 6-3, 189 pounds. Scouts see him deciding to pitch since he’s been so dominating. 1. Cole Hamels, LHP, Phillies — It will take four or five prospects to land him. The Cubs were unable to come up with a package to obtain him last week. The Phillies are asking for top prospects but the Cubs were unwilling to part with shortstop Addison Russell, who was obtained in the Jeff Sarmardzija deal to Oakland. The Rangers, Red Sox, Cubs, Dodgers, and Angels are seen as the major players for him this offseason. The Phillies can use Hamels as the major player in their rebuilding efforts and will hold on until they receive their ransom. 2. Justin Masterson, RHP, Cardinals — Huge few weeks ahead for Masterson, whose free agent value has dropped tremendously this season. Masterson is seen as a second-tier free agent who will come at an affordable price. The Red Sox will have interest in their former farmhand to solidify the middle of their rotation. It doesn’t appear Masterson will get a huge deal, but one major league source indicated a four-year deal in the $64 million-$70 million range might be the figure. 3. James Shields, RHP, Royals — He’ll be 33 when he hits free agency, but that shouldn’t deter suitors from offering him at least a four-year deal. The Red Sox, Yankees, Orioles, and Blue Jays will be in the mix for arguably the most dependable starting pitcher in the league the last eight seasons. Shields is a perennial, 30-start, 200-inning guy, is AL-East tough, and the dollars shouldn’t come close to what Max Scherzer or Jon Lester will receive in the market. “He’s thrown a lot of innings and pitched a lot of games and there’s always the possibility of breakdown, but the fact you might be able to get him at a shorter term reduces that big risk,” said an American League GM. 5. Koji Uehara, RP, Red Sox — Ben Cherington said there was a lot of interest in Uehara, 39, at the trade deadline, but the Red Sox want him to return. There were preliminary contract talks earlier in the season, but those were tabled until the end of the season. The Red Sox want to offer Uehara a one-year deal, but probably don’t want to go as high as a qualifying offer, which could get over the $15 million range. It appears Uehara wants to remain a Red Sox, but his family makes its home in Baltimore, so the Orioles could be a possible destination. 6. Jon Lester, LHP, A’s — Lester will be targeted by the Cubs in the offseason, which was further enlightened by the Cubs claiming Hamels on waivers last week. The Cubs were not willing to give up their best prospects to the Phillies to get Hamels, but their mind-set is clear. With top prospects such as Javier Baez now with the parent team, the Cubs are ready to spend for pitching. Lester is familiar with the Cubs brass, but the Cubs also have Max Scherzer on their radar. The Cubs would rather sign free agents than trade away their best prospects. 7. Stephen Drew, 2B/SS, Yankees — Looking more and more like he will be Derek Jeter’s heir apparent at shortstop. Drew will likely seek a multi-year deal. He hit .174 with the Red Sox and was hitting .176 through Thursday with the Yankees. “The defensive metrics on him are better than ever at shortstop,” said one Yankee official. 8. Kevin Youkilis, 1B — It doesn’t appear he will return to Japan to finish out the season for the Rakuten Golden Eagles. According to his agent, Joe Bick, the plantar fasciitis that has curtailed his season is still in a painful stage. He signed to play in Japan in March. From the Bill Chuck files: “On May 18, Jackie Bradley Jr. was hitting .218; on July 6, he was hitting .218; on July 10 he was hitting .218; on Aug. 3 he was hitting .218; and on Aug. 6, he was hitting .218.” . . . Also, “Each successive year since 2010, there have been more games with teams scoring just once. Last year, there were 544 one-run scored games, so far this season there have been 389.” . . . Happy 35th birthday, Brandon Lyon.